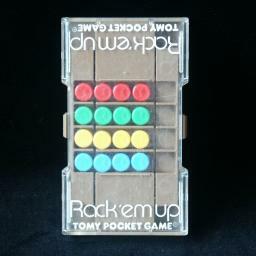 Rack'em Up is a puzzle manufactured by Tomy. It consists of an array of 4 rows which each contain when solved 4 round pieces and a blank space. Tilting the puzzle left or right causes the pieces in every row containing a blank space to slide to the left or right. The pieces cannot slide up and down because the rows are separated by thin walls. The left or right column of the puzzle can be moved up one row, or down one row (so both columns have three positions - up, centre, and down). Shifting these columns allows the pieces and the blank spaces to change rows, and mix the puzzle up completely. There are 4 pieces of each of the colours green, blue, yellow, and red. In the solved position each row has only pieces of one colour. The puzzle is closely related to Row by Row, also by Tomy. The main difference that influences gameplay is the number of blank spaces. It was invented by Mizunuma Masanori and Watanabe Hiroyuki, and covered by the same patent as Row By Row, patented by Tomy on 13 November 1984 (filed 7 May 1982), US 4,482,154. Lets assume that each row contains four pieces, with a blank column on the right. Also, let's consider positions that differ only by column shifts to be identical. There are 16 pieces, and if they were all different this would give 16! possible arrangements. There are however four sets of four of indistinguishable pieces, so this leaves only 16!/4!4 = 63,063,000 positions with four pieces in each row. Tilting the puzzle to the left or right, i.e. shifting the pieces of the row containing the blank to the left or right, is denoted by the letters L and R. Moving up the left or right column is denoted by Ul and Ur, and similarly moving them down by Dl and Dr. I will give two solutions. The first uses move sequences 1-3 only, and the second only 4-6. Phase 1: Solve the middle pieces of the third row. Decide which colour you want the third row to be. Use 1a or 1b to bring one piece of that colour to the left of the second row. Do sequence 3 to slot that piece into position on row 3. Repeat steps b and c once more to solve another row 3 piece. Phase 2: Solve the middle pieces of the second row. Decide which colour you want the second row to be. Turn the puzzle upside down. Use the method of phase 1 to make the middle pieces of row 3 your chosen colour. Turn the puzzle upside down again. Phase 3: Solve the outer pieces. Decide what colours you want the top and bottom rows to be. Do 1a/1b to put as many pieces correct as possible. 1. Do 1a/1b until the piece to swap with lies on the top row in the second position from the left. 2. Do move sequence 2 to swap it with the top left piece. 3. Do 1a/1b to return the outer pieces back to their original position. Repeatedly use step c to solve the outer pieces - each time putting the top left piece into a correct position, replacing an incorrect piece. Phase 1: Separate the top and bottom colours. Decide which colours you want the top two rows to be. Use 4a or 4b to bring one piece of one of those colours to the right of the third row. Use 4a or 4b to bring one piece that is not of one of those colours to the left of the third row. Do sequence 6 to swap the two pieces. Repeat steps b-f until all the pieces in the top two rows are of your chosen colours. Phase 2: Solve the bottom two rows. Use 4a or 4b to solve as many pieces of the bottom two rows as possible. Any incorrect piece on the third row can be shifted one position to the right as follows. 1. Use 4a/4b to bring it to the rightmost position of the third row. 2. Do sequence 5 to swap it with the next piece. 3. Do 4a/4b to undo the moves in step 1, bringing most pieces to where they where before. By repeating step b, any incorrect piece on the third row can be shifted all the way to the rightmost position of the third row. Any incorrect piece on the fourth row can be shifted one position to the right as follows. 1. Use 4a/4b to bring it to the rightmost position of the fourth row. By repeating step d, any incorrect piece on the fourth row can be shifted all the way to the rightmost position of the fourth row. If there are any incorrect pieces in the bottom rows, then use steps b-e to shift them to the rightmost positions and then use sequence 5 to put them in the correct rows. Repeat f until the bottom two rows are solved. Phase 3: Solve the top two rows. Use the method of phase 2 to solve the bottom two rows.